Piles of snow can still be seen dotted around Bath University’s large campus as a stark reminder that Britain is still in the throes of another cold winter. It was only a few days ago that the entire country was covered in snow after one of the worst snow storms in years. Despite the weather the University has pulled out all the stops to ensure the success of staging UK’s first Federation Cup in twenty-six and judging from yesterday’s sessions everything is going to plan with no major hic-ups or problems to deal with. Tennis is a popular sport with locals and the University’s Tennis Academy, part of the LTA’s Tennis Initiative Programmes is where hundreds of local children learn to play tennis. To LTA’s delight tickets for both sessions were mostly sold out even before the event started, and tickets for all three sessions when GB plays are almost sold out. In total over 360 spectators watched both sessions on the opening day which amounts to almost a full house for both sessions. This year’s Fed Cup Tie is very important to Team GB, not only as the host national but also to prove they deserve to reach the elite World Cup group equivalent of the Davis Cup status and something GB team captain Anne Keothovong is aspiring to in front of home crowds. The first day’s matches saw Team GB played solidly against Slovenia winning all three matches. First matches of all teams features their number two player and in the case of Team GB it was up Katie Boulter currently ranked 83 in the world, and Britain’s number to prove she is Britain’s up and coming player. Against a lesser ranked player, Boulter dominated the match by soundly beating Slovenia’s Kaja Jakupovic 6.4 6.2, proving she is a future top player in the making.. In the second singles, Britain’s number one Joanna Konta ranked 39, (once as high a 4 in the world) played well to beat Dalia Jakupovic. In the first set tie break Konta was 4-1 and looked to be on the robes but produced two superb aces to even the score and went on to win the first tie-break 9-7 much to the huge relief of the extremely noisy but lively contingent of British supporters all dressed in red and waving Union Jack flags. The highest ranked player, Donna Vekic from Croatia won her match against Turkey and ended with Croatia winning 2-1. In the other matches, Serbia beat Georgia 2-1, and Hungary surprisingly beat Greece who has Maria Sakkari ranked 38 in their team. 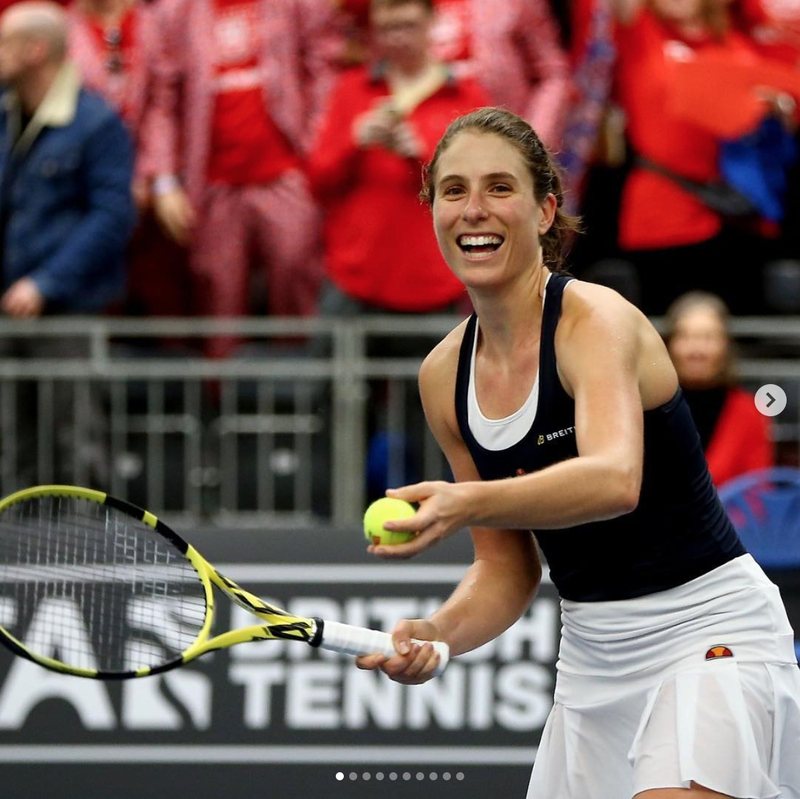 GB’s are particularly looking forward to the next session which sees them up against Greece and obviously the player to beat is Sakkari who plays Jo Konta in the second session. ← Previous Story Oracle Challenger Series • Indian Wells Player Lists • Many ATP | WTA Top 100 Ranked Players • Free Entry 2/23-2/28 At The I.W.T.G.